The Douglas A-4 Skyhawk is a carrier-capable ground-attack aircraft designed for the United States Navy and U.S. Marine Corps. The delta winged, single turbojet-engined Skyhawk was designed and produced by Douglas Aircraft Company, and later McDonnell Douglas. It was originally designated the A4D under the US Navy's pre-1962 designation system. Fifty years after the aircraft's first flight, and having played key roles in the Vietnam War, the Falklands War, and the Yom Kippur War, a few of the nearly 3,000 Skyhawks produced remain in service with several air arms around the world, including active duty on the aircraft carrier of the Brazilian Navy. 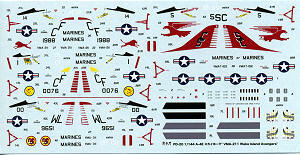 This is a great addition to 1/144 jet aircraft kits. 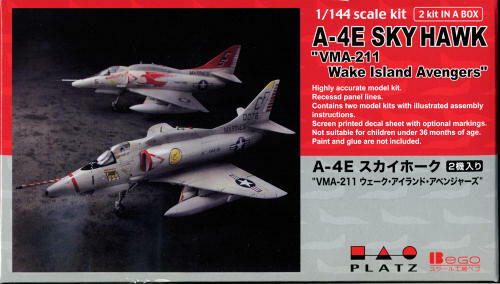 The Skyhawk was built in huge numbers and now we have a nicely done version in 1/144. Platz kits are right up at the top of the line in terms of detailing and this kit is no exception. There are over thirty parts to each kit and you do get a pair of them. 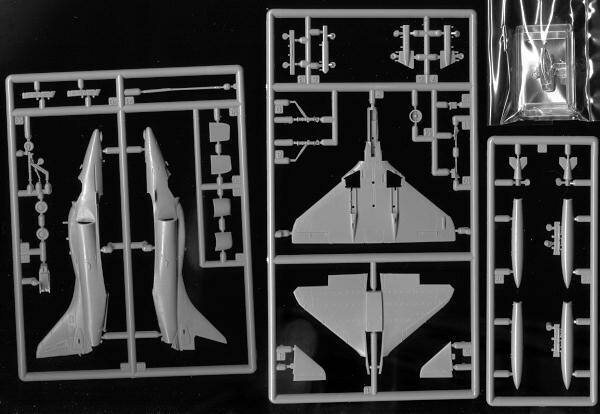 The kit includes wing and centerline pylons with a pair of drop tanks. The wing is pre-drilled for the centerline pylon. No weapons so those will have to come from a different source. These are versions with the upper fuselage avionics hump that includes an ARC-27 command radio, ARA-25 UHF direction finder and APX-72 IFF system. A very nicely done bang seat is provided for the interior and it actually looks like a Douglas Escapac seat. A single piece canopy covers all this. The instructions are in Japanese, but this isn't a problem as the construction illustrations are quite clear and easy to follow. There are markings for four aircraft, all of them in light gull grey over white. 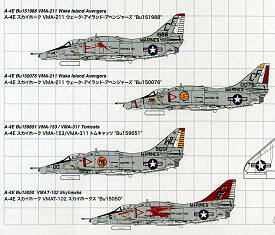 Two are from VMA-211 with one of them having the leaping lion on the fuselage side and the other with the unit badge and a partial red rudder. This latter option also has a red nose stripe that was carried over to the A-4M. A third option is from VMA-311 and the last is a very colorful VMAT-102 plane with the red rudder and large fuselage marking that this unit carried. The colorful sheet is superbly printed by Cartograf so you know they are of the highest quality. Platz wants to be your 1/144 military model company and with kits like this they are certainly getting there, at least in terms of the subjects they have so far released. These will not take up much shelf space, but will provide a goodly level of detail and interest. My thanks to www.platz-hobby.com for the preview kit. Get yours at your local retailer.